It was a barn once, and for a long time. It was a barn already in 1837 when a Hewins first put his name on the deed on Hewins Street in Sheffield and began the labor intensive, repetitious seasonal work of farming in New England; milking cows in the stone lined first floor and filling the bays above with summer's sweet timothy and clover. It had survived centuries of storms and hay storage- snow that piled on roofs replaced over the years, and hay that sometimes got hot in storage after being gathered from the shady, outside woodline rows along fertile fields in the river plain. But not now, not in March when the last rows of dry hay were being peeled away and tossed through an opening in the floor every hay tender knew to step over. 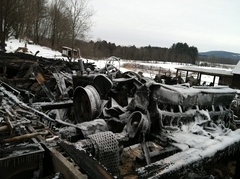 Six horses had already been let out when the old barn heaved its last breath Monday morning. Terri Licata was done with chores by 7 a.m. and had gone up to see her mother next door on that cold morning. An electrical short, possibly related to a heating rod used to keep water from freezing, had touched off combustibles on the lower level. Someone called. The barn was on fire. Flames were just licking at the siding. By the time Licata returned, local Fire Chief Rick Boardman was in the street launching a coordinated effort that would involve a dozen fire departments and hundreds of thousands of gallons of water. But the fuel was to rich. Once ignited, the burning hay couldn't be stopped. Water hoses protected the carpentry shop as heat melted the siding, and Licata's home next door. "If I could pick, I'd have wished the house had burned instead," she said. "It hurts so much." The twisted metal of the antique tractors her father Walter Hewins Jr. had kept in running order until his death eight years ago at the age of 74 jutted out from the blackened corpse; rubber gone. The driving wheel of the skeleton of a 40s model John Deere framed the iconic fertile valley and the Taconic ridgeline beyond. Icycles dripped from the twisted metal of farming implements, positioned at the ready to be driven out. "I can remember him laying out the parts from one tractor or another, then putting them back together so they always worked," Licata said. "Each one had a different job." Licata has seven siblings, three of them brothers and all involved more or less in the farm. The first bay a few steps from the roadside was the oldest and held hay bales, criss crossed carefully by tenders in the summer to maximize space. A knee pushed in the last bale at the end of each row, which rose up to the cross beams where swallows flitted in and out of their nests. Once in a while, mice ate through the baling twine and left the hay to be gathered loosely to be sold for less than the cost of producing a bale. The floor had been worn smooth by a century's worth of horse's hooves that trod over it before tractors did. t was the sort of place author E.B White had in mind when he wrote Charlotte's Web. In the chapter, Escape, he might have been inside the Hewins barn, instead of the one Homer L. Zuckerman owned where Fern tended the most famous pig ever. It was, he said, a barn that was very large and very old. "It smelled of hay, and it smelled of manure. It smelled of the perspiration of tired horses and the wonderful sweet breath of patient. cows. It often had a sort of peaceful smell, as though nothing bad could happen ever again in the world. It smelled of grain and of harness dressing and of axle grease and of rubber boots and of new rope." It was full of all sorts of things that you find in barns; ladders, grindstones, pitch forks, monkey wrenches, scythes, lawn mowers, snow shovels, ax handles, milk pales, water buckets, empty grain sacks and rusty rat traps. It was the kind of barn that swallows like to build their nets in. It was the kind of barn that children like to play in." It's where Tim Hewins broke his arm jumping into the hay from a rafter, and generations of Hewins have toiled. It's where Robert Hewins was the last to milk cows in the mid 1960s before moving on to other ventures. And when a Hewins was done, the town laid them to rest in the Hewins Cemetery. The carcasses of a half dozen vintage tractors are piled against eachother now in the barnyard, like wartime rubble. In the back was a tool and work shop, where an implement could once be found for just about every task- if not manufactured, then made by hand. It was on first blush a messy jumble of things, until the eye adjusted to its odd sort of order with enough room to walk from one end of the 100 foot long length to the other. One of the uncles who returned from war in the 1940s bought four shiny battleship grey stanchions lined with wood, and stored them in the barn intending to replace the older wooden ones. But the days of family farming were already waning. The nearly forgotten stanchions were retrieved five years ago and now click shut around my cows in Sandisfield, treasures now even more coveted as reminders of a vanishing way of life. The neat cuts to square logs made in virgin timber by the sound of squaring axes in the 1700s was silenced by the crackling flames that roared through them despite valiant efforts by firefighters. The stalwart timber frame crumbled, but four days later boasted solid wooden cores and tight joints as hay still smoldered around them. It was a loss that struck deep in the heart of the community as well as a family. For the same reason they honked or waved if a barn door was open in the summer or a familiar truck or car was outside, they came in a steady stream this week to mourn. Who can measure the loss to future generations, who will never know the peaceful sound of animals stirring in winter, the pure joy of a swing hanging from a beam, or the blissful, excrutiating heat as the last bales pile high against the cross beams while swallows chirp their summer song and tend their nests. Ultimately though, loss is as much a part of farming as renewal. As if to remind of the pattern, Licata's three year old granddaughter assessed the damage. "We've got to clean up this mess," she said. 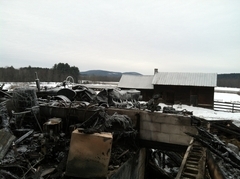 Brigitte Ruthman farms in Sandisfield.